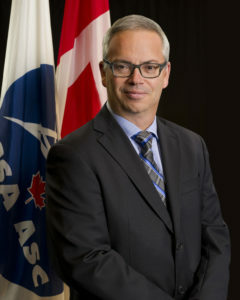 Sylvain Laporte was appointed President of the Canadian Space Agency in March 2015. Prior to this appointment, he was Chief Executive Officer of the Canadian Intellectual Property Office (CIPO), Commissioner of Patents, Registrar of Trade-Marks since 2011. Previously, he held the position of Executive Director, Industrial Technologies Office (ITO) at Industry Canada where he was responsible for managing financial contribution programs in research and development for the aerospace, defence, security and space industries. Mr. Laporte joined Industry Canada in March 2007 as the Chief Informatics Officer (CIO). Before joining the public service, he worked for Canada Post Corporation in various sectors, such as marketing, retail, logistics and information technology. Mr. Laporte gained extensive experience as an Aerospace Engineer over the course of his 20-year career with the Canadian Forces. He held various positions in such fields as engineering, maintenance and human resources management. Mr. Laporte earned a Bachelors degree in computer science from Collège Militaire Royal de Saint-Jean, and a Masters degree in computer engineering from the Royal Military College in Kingston.